The European “New Approach” Directives are the basis for CE (Conformité Européenne) marking. According to these directives, products must meet certain requirements before being sold in the EU, with manuals playing a vital role in the regulatory process. In order to ensure that your product is able to be widely distributed within the EU, it’s important to know what the European New Approach Directives mean, and exactly how they will impact you and the manuals of the products that you offer. In essence, the European “New Approach” Directives set forth a number of essential requirements regarding the safety, environmental impact, health, and consumer protection for products that are being bought and sold within the European Economic Area (which is commonly referred to as the EEA). The directives, in many respects, form a basis for CE marking. The requirements mentioned above apply to a variety of different products, from medical devices to toys, each of which must adhere to strict manufacturing standards. The directives themselves are developed by the European Commission, the business marshal, or the Advisory Commission, who will propose a new directive. It is then passed onto the European Council of Ministers, who will decide whether or not the directive is to be formally adopted. If the process is successful and the directive is formally adopted by the European Council of Ministers, the member states are then obligated to integrate the new requirements introduced by the directive into their legislation. Typically, this must be done within a specific time period, which is usually two years. 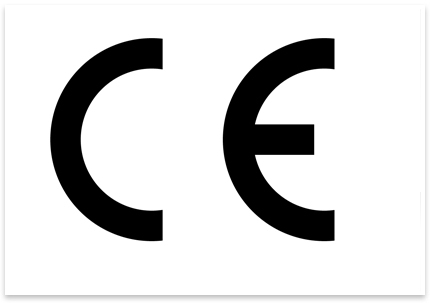 Implementing CE marking should be done by either the manufacturer or the trading company. Define the intended use and potential risks of your product. Determine which directives may pertain to your product. You can do this by checking to see if your product falls within the purview of other pre-existing directives. Carry out a thorough risk analysis and safety assessment by testing the product based upon the essential requirements. If problems are detected, then take steps to bring your product in adherence with European standards. Carry out the appropriate certification procedure (seek the assistance of a governmental or certification body, if necessary). Study the European standards and determine which apply to your product. Verify that the parts used to manufacture the product have adequate documentation and all necessary declarations. Verify that all contracts (including those regarding the procurement of parts) are complete. You also need to verify that each component has a an agreement pertaining to the CE marking. Ensure that note of delivery contains all pertinent information, particularly in regards to the CE marking. Create a user manual for the product and translate it to the appropriate language (depending upon the countries in which the item will be distributed). Compile a Technical (Construction) File for the product and place in it in the archives. Develop a “Declaration of Conformity”, which must be signed upon completion. Place the CE Mark on the product (or packaging, if applicable). Verify that all purchase agreements are in order and that the necessary CE marking documentation has been provided. Verify that a user manual for the product has been provided, and that it has been translated to the appropriate language (depending upon the countries in which the item will be distributed). Ensure that you have received a “Declaration of Conformity”, which must be signed by the manufacturer. Verify that the CE marking has been applied to the product (or packaging, if applicable). As a general rule, the essential requirements often pertain to the technical safety standards of the product in question. These practical requirements can be found in Annex 1 of the European “New Approach” Directive, and must be adhered to in order to distribute your product within the EEA. To determine if your product meets the essential requirements, government inspectors will examine and assess the product to ensure that it is up to par with the current standards. Documentation and vital product information is also considered during the inspection process. This pertains to the product’s user manual, installation instructions, maintenance suggestions or recommendations, the “declaration of conformity” and the CE marking. These are all important aspects that are required in order to meet European standards. For instance, the “New Approach” directives stipulate that all products that are to be distributed within the EEA be accompanied by instructions for use. In fact, the EN 82079-1, which is a European conformity (or harmonized) standard, sets forth minimal requirements in regards to a product’s instructions for use. A vast majority of products should include a user manual that explains how the product can be used safely, in order to meet consumer protection requirements. Also, the manual should offer instructions to the consumer (using easy to read language, rather than technical jargon), which will allow users and service people to maintain or repair the product. If your product is going to be offered solely to consumers, then a user manual is sufficient. It is important to note that all potential hazards and risks must be mentioned in the user manual of the product. The dangers associated with improperly using the item should also be outlined. In order to adequate formulate these consumer warnings, manufacturers should be aware of essential requirements, have an understanding of the knowledge and experience level of the consumer, and properly test the product to determine potential risks. Most of the “New Approach” directives dictate that user manuals must be translated into the language of the country where the product is being distributed or used. The individual or entity who imports the item into the country is held responsible for ensuring that the manual has been translated into the country’s specific language. This also applies to trading companies, given that the manufacturer is often unaware of which regions their products are being exported to by third parties (i.e. importers and trading companies). A Technical (Construction) File consists of a detailed explanation of the product’s design and how to safely use the product. This Technical File contains schematics, drawings, certifications, analysis reports, the user manual, component lists, and other vital information. This file must be retained by the manufacturer, who must present it to any notified body upon request. If the physical document it is not available at the time of the request, then it must be presented within a few weeks time. Technically, the documents must legally be retained for a period of 10 years after the initial manufacturing date of the product. However, if the product is part of a series, then the 10 year time frame starts when the last product within that series is produced. 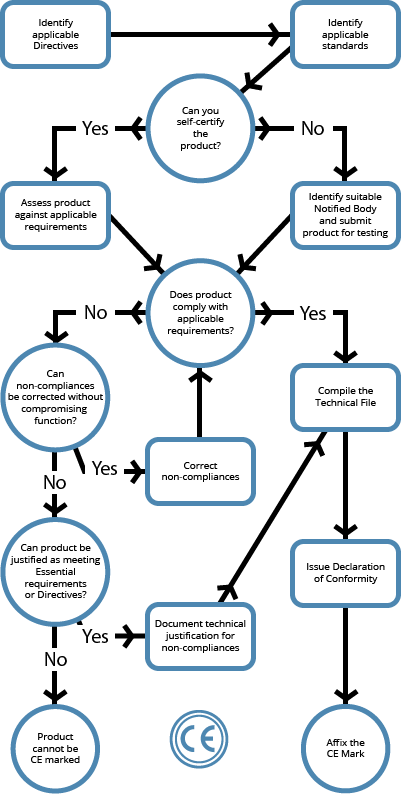 In some instances, the Technical File is a vital component of the conformity assessment.